Poor gut health and dysbiosis have been linked to depression, migraines, eczema, IBS, SIBO, leaky gut, and more. If you suffer from these or other gut health issues, you may benefit from taking probiotic supplements. Here are 10 signs you need probiotics and which ones to take. Our understanding of the role of probiotics – not only in gut health, but in many other areas – has grown exponentially in recent years, and new studies are published all the time revealing more areas of our health that benefit from these powerful organisms. All of the following have been linked to dysbiosis (an imbalance of good and bad bacteria in the gut) and poor gut health, and studies show that all improve with probiotic supplements. In addition, many scientists, doctors, and nutrition experts (including myself) believe that simply living in today’s toxic and inflammatory world results in some amount of intestinal imbalance (dysbiosis) that may benefit from consumption of probiotic rich foods and/or probiotic supplementation, even if glaring symptoms like these aren’t present. There are a lot of choices when it comes to probiotic supplements. There are three main types of probiotics to consider with some overlap in how they work, but some unique features as well, and more research being published all the time to help us understand what each of them do and when to take them. 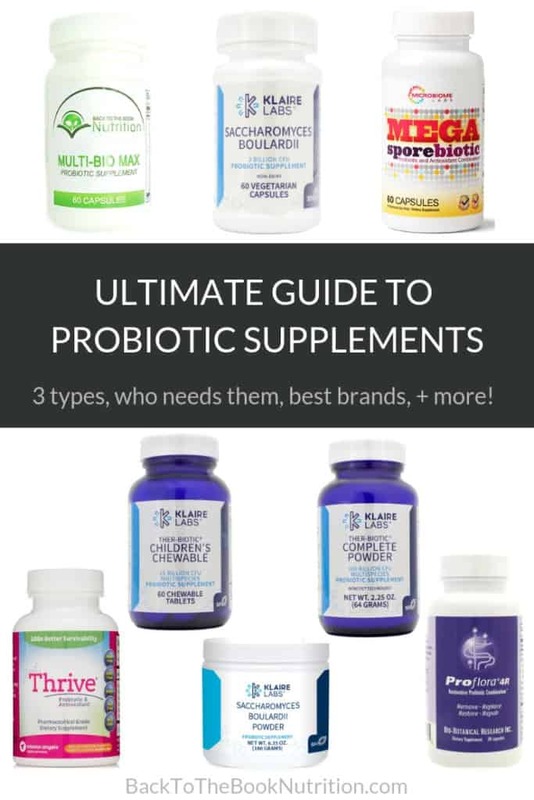 Check out this Ultimate Guide to Probiotics for even more details about the best probiotic supplements! 1. Sanders, 2008. Clin Infect Dis. 2. Ducrotte, et al., 2012. World J Gastroenterol. 3. Guglielmetti, et al., 2011. Aliment Pharmacol Ther. 4. Brown, et al., 2012. Nutrients. 5. Teixeira, et al., et al., Clin Nutr. 6. Sanchez, et al., 2014. Br J Nutr. 7. Messaoudi, et al., 2011. Br J Nutr. 8. Rao, et al., 2009. Gut Pathogens. 9a. DeRoos, et al., 2015. Beneficial Microbes. 9b. Van Hemert, et al., 2014. Frontiers in Neurology. 10. Healthline.com: Can probiotics treat a yeast infection? 11. Chisholm, 2015. Urologic Nursing. 12. Australian Associated Press, 2015. 13. Kuitunen, 2013. Curr Opin Allergy Clin Immunol. 14. Abrahamsson, et al., 2007. J Allergy Clin Immunol. 15. Logan and Bowe, 2011. Gut Pathog. 16. Kalliomaki, et al., 2015. Pediatr Res. 17. Hsiao, et al., 2013. Cell. 18. Sonnenburg and Sonnenburg, 2015. Scientific American. 19. Hurley, 2011. Psychology Today. 20. Heller, 2001. Am J Clin Nutr. 21. Liu, et al. 2018. Nutrients. 22. McFarlin, et al., 2017. World J Gastrointest Pathophysiol. 23. Amer, et al., 2018. Altern Ther Health Med. 24. Heczki, et al., 2015. BMC Women’s Health. 25. Loman, et al. 2018. Nutr Rev. This is new information for me. Thanks for sharing it. I’m glad to hear it was helpful to you! Great – so glad it was helpful to you! That sounds awesome! I used to make ginger kombucha and it was one of our favorites too! Thanks for the great article! I’m really interested in learning to make kombucha at home… but I need to wait for life to slow down a little! It’s definitely easy, but a big time commitment. I used to brew our own and flavor it, but I kept getting behind schedule, which throws off the flavor. I had to set it aside until life slows down. Amazing post, very informative. Generally people ignore their Gut health, this will surely create an awareness among everyone. Agreed – and it’s so essential for overall health! This is such a great product and is a must for any health cautious people. This should be in our necessity of supplement to take. Thanks for your comment, Karlyn. I find the best way to get probiotics into my system is through food. Yogurt works for me. Very interesting and very informative post. I think I need to have this in my daily lives as I have migraines that sometimes gives so much of discomfort. Thank you for sharing this with us. Hi Geraline, So sorry to hear about your migraines! Tending to your gut health can definitely help, as can magnesium glycinate, which I’ve seen result in dramatic reduction of migraines in multiple clients. Sounds like they’d be worth a try for you, Erica!! I’ve been looking at different probiotics for years, but find the different choices overwhelming. There are so many different strains! I’ve had IBS for years though and I think these can really help with gas and bloating! Thanks for sharing these tips! You’re right – there are so many different options. I truly believe my Multi Bio Max Probitoic is a good place to start for most people – it consistently gets rave reviews from customers who’ve tried other lactobacillus based probiotics with little benefit. Soil based organisms (SBO’s) like Megaspore have also helped many with IBS. Either one of those would be worth trying. Hope that helps, Frank. What type of probiotics should I take though? I get UTIs, migraines, and I have mental health problems. I am taking some probiotics right now but I don’t know if they’re the right kind. Does it matter? Hi August, I sell this probiotic that I believe is a great start for many people, but I suspect that a probiotic supplement may not be all you need to fully address the issues you mentioned. I do see similar challenges in many of my clients, and they very often improve with a comprehensive approach of diet + supplements + testing to identify and address hormone and/or gut health issues. I truly believe you’d benefit from working with a holistic or functional medicine practitioner who could create a personalized plan to guide you. If you’re interested in working with me, you can learn more about my services and message me with any questions you have via my Holistic Nutrition Coaching page. Probiotics can be so great for so many people. I just started last year and has truly changed me inside and out. That’s wonderful to hear, Tosha! I had no idea that autism and autism spectrum disorder could be a sign of gut issues. Also, wonderful information regarding yogurt use. I was in the camp that thought simple consuming yogurt would be enough. Thanks for this detailed post! So glad it was helpful to you, Lindsay! And yes, addressing gut health can make a huge difference for those with ASD! I haven’t been good at taking probiotics in recent years! I definitely need to stock up. Thanks so much for sharing! You’re welcome, Cecilia – thanks for reading. This is a really interesting post indeed. I definitely learned a lot about probiotics and how to tell if one needs to take them. This will surely help people out! Such a helpfull tips! 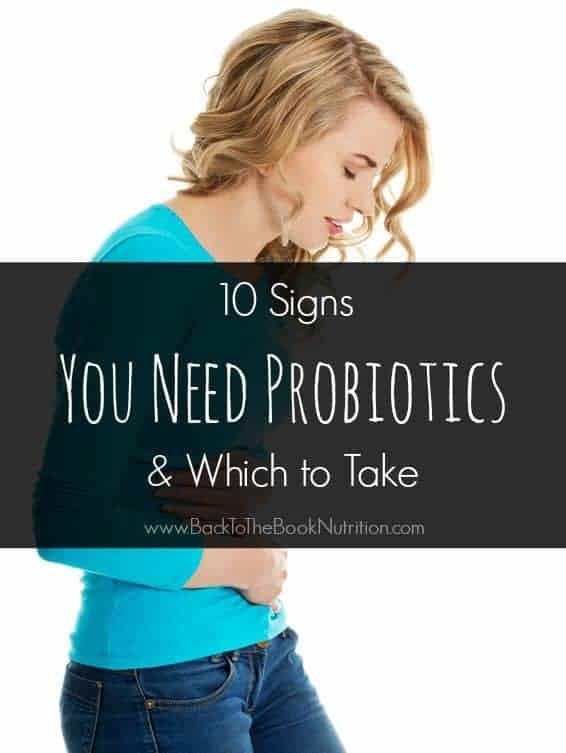 Many of us don’t know the signs listed are needed a probiotics. I think this kind of product will be really helpful to us! I am glad to know about this. Glad you enjoyed it, Gladys! I just am an addict when it comes to probiotic drinks…i take it daily and my fav one is Yakult 🙂 Great write up and thanks for sharing must try and see if we do get these in India. This post is very informative. I have noticed a difference in how I feel when I take a probiotic regularly. It’s time I take it out from under the sink (check the expiration date) and start using it again. Thanks for sharing! It’s great that you’ve seen great results from taking the probiotic, Ashley!